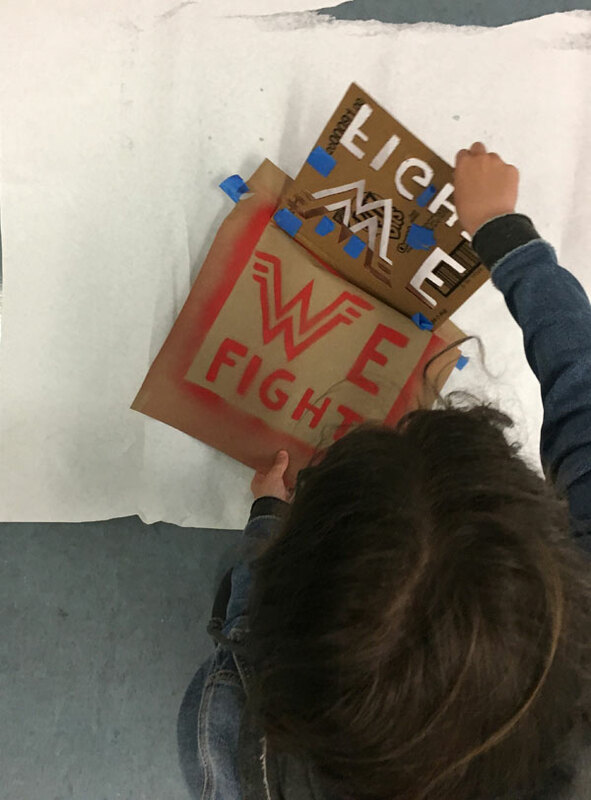 The week before camp started this summer, Twitter exploded with Bible quotes protesting the treatment of immigrants seeking asylum in the U.S. 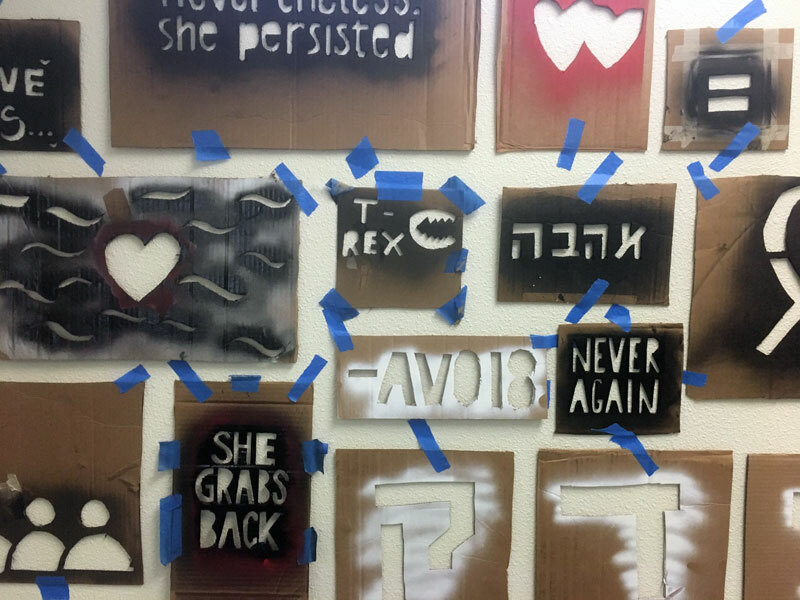 So much of our Torah seems made for protest signs — because so much of our people’s story is about rejecting the status quo and looking toward a better future. 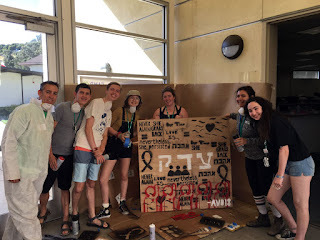 So when asked by the URJ Camp Newman director to come up with an activity for the Avodah campers — a session dedicated to community service and social action — Rabbi Shawna and I decided to try something new: social justice art. 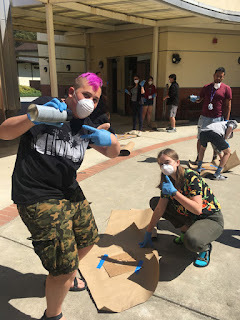 We already had a bunch of knives, and plenty of cardboard ready to be upcycled, so we just needed a few more things: breathing masks, gloves, and LOTS OF SPRAY PAINT. 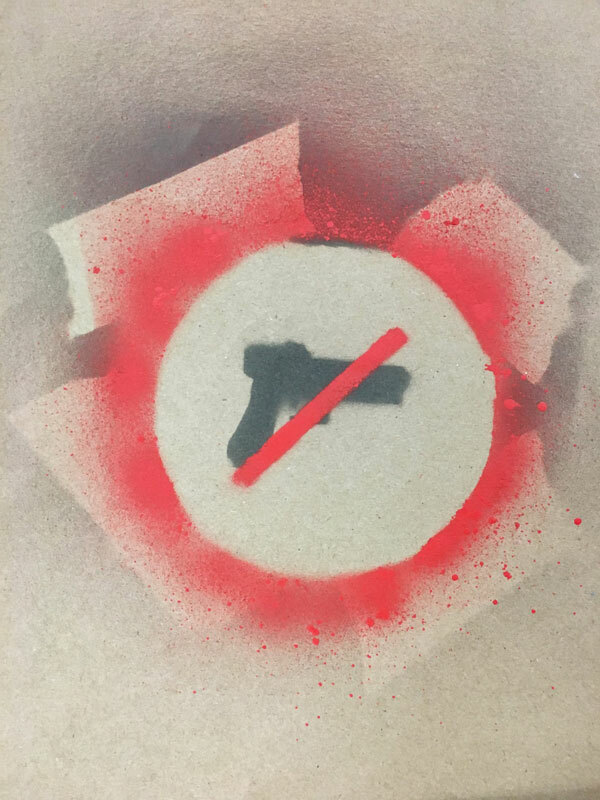 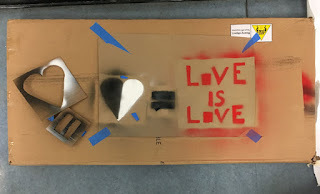 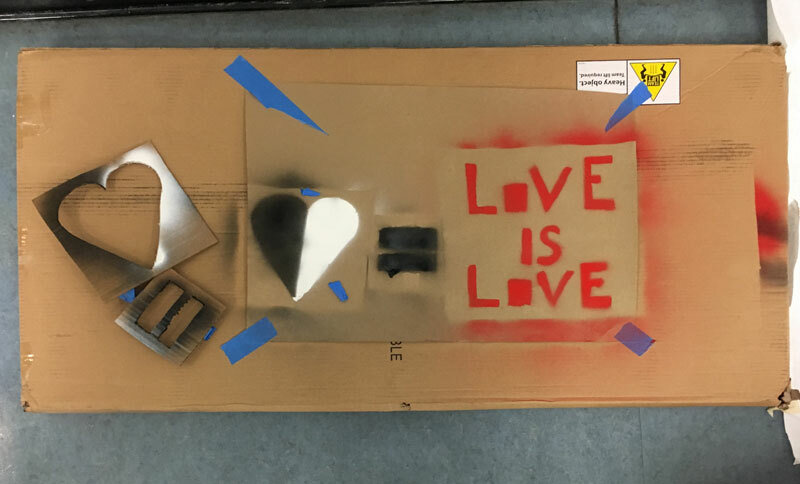 Day one was learning how to use the tools: getting comfortable cutting cardboard stencils and building spray booths to safely (and cleanly) practice stenciling — and then doing some test stencils. 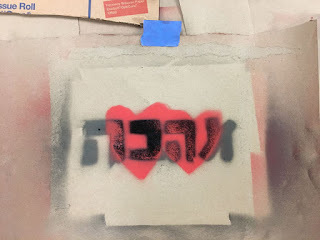 As with every art workshop we lead, this one relied heavily on Jewish text and context. We introduced the idea of Judaism as a religion that encourages questions, and questioning authority — of never accepting things as they are, but advocating for a better world, loudly and clearly. 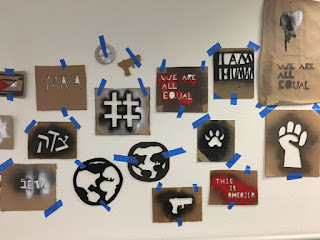 We emphasized that protest does not have to be limited to complaining and criticizing, but can be about inspiring action and change. 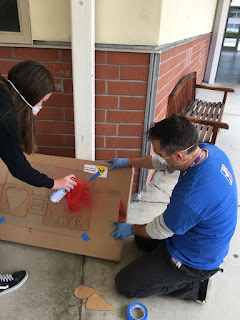 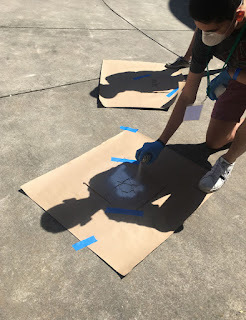 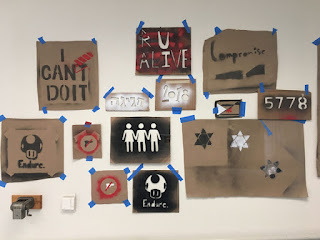 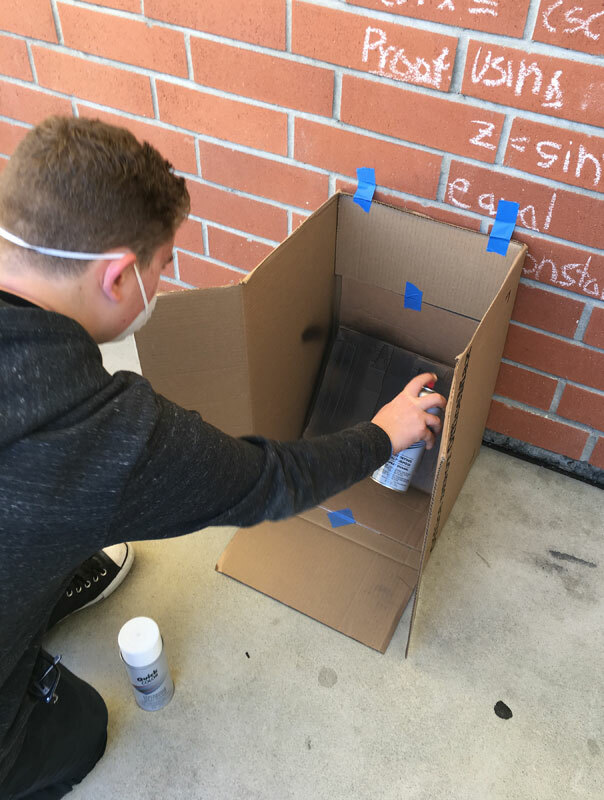 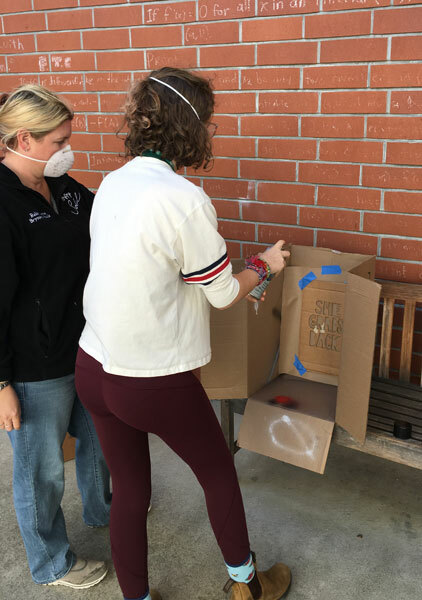 We combined that with the traditional role of stencil graffiti as a way to quickly and clearly communicate messages to a wide audience, and soon the campers were turning their ideas about the world around them into stencils. 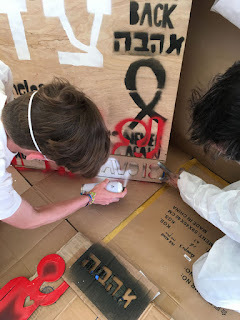 We shared with them Banksy’s quote: “If graffiti changed anything, it would be illegal.” Because yes, art can be powerful and dangerous. 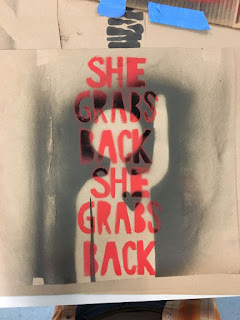 But we weren’t planning to turn these campers into vandals — we encouraged them to consider how their art could be shared legally: on signs pasted up around camp with removable painter’s tape, as images to be shared digitally, and as signs and posters to amplify their voices at rallies. 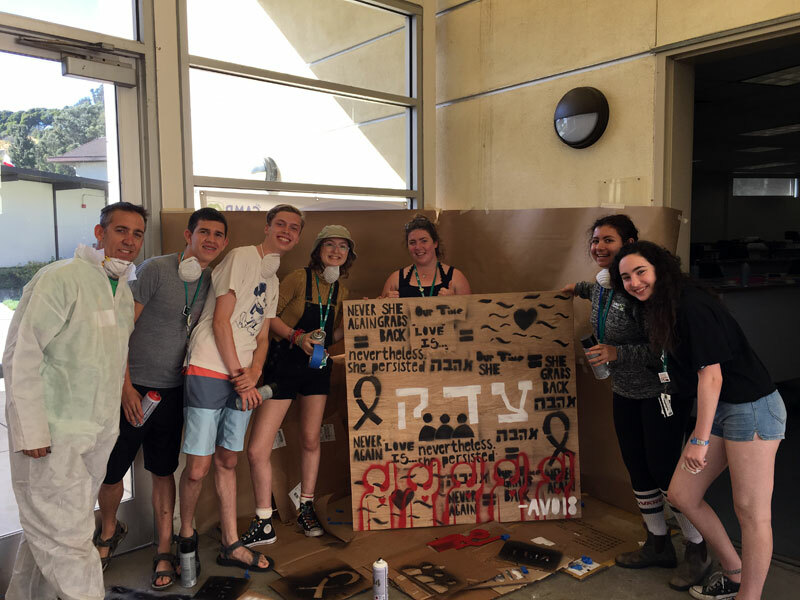 For instance, every summer Avodah marches in the San Francisco Pride Parade and attends the AIDS Walk San Francisco — and they created art to share those messages. 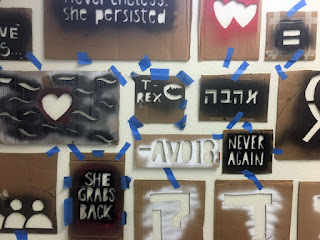 We struggled with how to share Jewish text, and we were surprised with the teens’ discomfort at listing book, chapter and verse; they felt that this was Christian way to share text and instead chose to center their work around the concept of tzedek — “justice” — with the other messages placed around it. 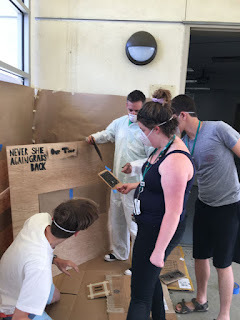 It was fascinating to see how they created their personal messages, but also how they combined those messages together to make a plywood “wall” to share with camp — integrating their messages and imagery into one big collaboration. 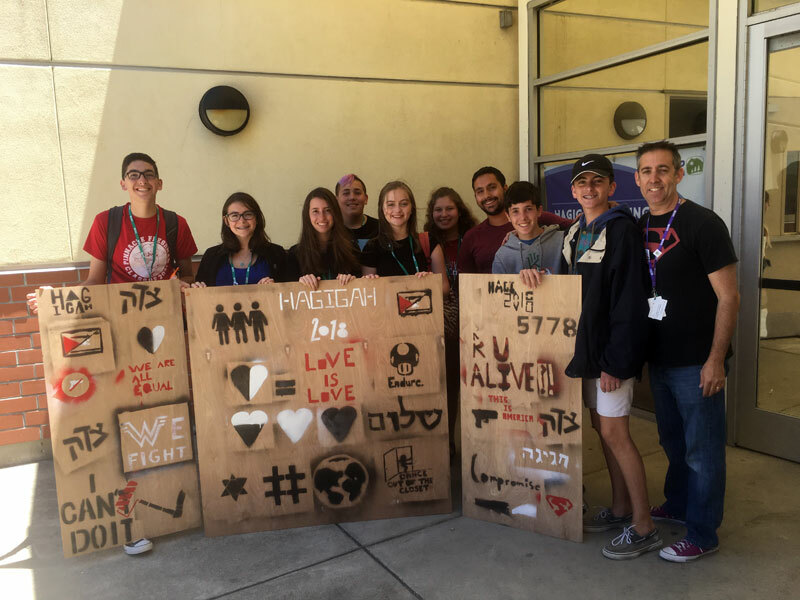 They chose to overlay their messages with people raising their hands to step up, their hearts united in love. We also had the opportunity to create protest art with campers from the Hagigah session, which is focused on the arts; I was joined at these sessions by Rabbi Laura Novak Winer, the session rabbi, who taught about Judaism being a protest religion and how even our monotheism was countercultural. These campers had more time to experiment with the tools, and to explore more messages — and they wowed us as well. 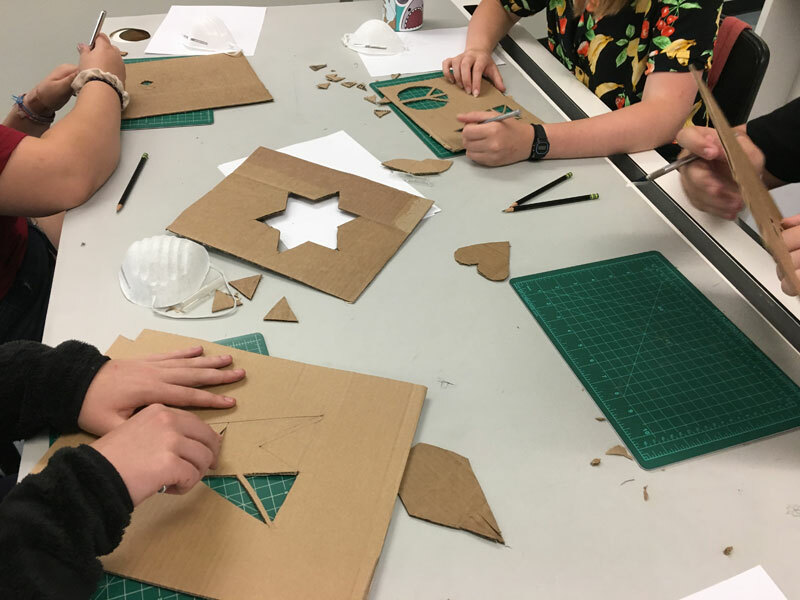 They, too, had individual pieces that were even more powerful when combined with the work of their friends and peers — creating a plywood triptych for display in the annual Hagigah Peachy Levy Arts Festival at the end of their session. 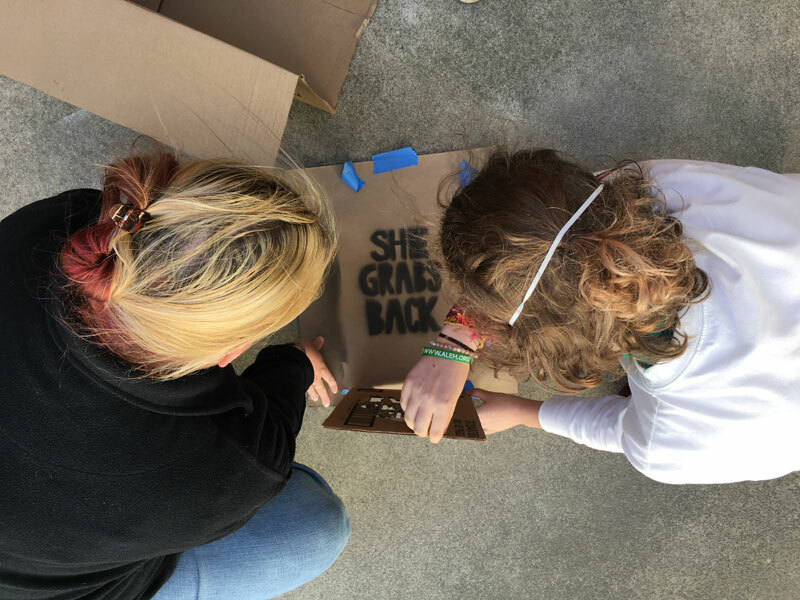 I am so inspired by these campers, who are finding their voices and learning to make themselves heard.